It is not often that a book jumps out at you as being fresh, original and excellent within minutes of starting to read it – but this was definitely the case with Adam Rutherford’s Creation. It is about both the biological origins of life and how we are artificially changing the nature of life with synthetic biology. I have read plenty of books on basic biology, but Rutherford triumphs uniquely by giving us a clear exploration of the nature of life, breaking it down to its simplest components and seeing how these could have come into being. This goes far beyond the old ‘organic soup plus lightning’ concepts and takes us across that most difficult of jumps from a collection of organic compounds to something that has a living function. To be honest, that would be enough on its own, but Rutherford also gives us an excellent and eye-opening look at how we are modifying and constructing life, from Craig Ventner’s synthetic bacterium, through ‘programmed’ bacteria to the practical applications of modified life. This synthetic biology is much more than the basics of genetic engineering and is totally fascinating, perhaps even more so than the ‘origin of life’ part. The problem with this is that at the time Big Bang was a seriously flawed theory, and arguably Hoyle et al’s alternative Steady State theory was better – Big Bang was certainlynot the overwhelming consensus view. It was only later data, combined with a much hacked about and improved Big Bang theory that made it become that. To put it as Rutherford does totally misrepresents the significance of Hoyle’s theory at the time. The other moan I have is the way the book is put together (I don’t think this applies to the US or Kindle versions). The two parts of the book, exploring the origins of life and looking at the synthetic future, are in two totally separate halves, begun at opposite ends of the book, one printed inverted to the other. This implies the two sections are independent and can be read in any order – but they aren’t. This is obvious as the introduction of the forward looking section has several references to reading the other section for detail. 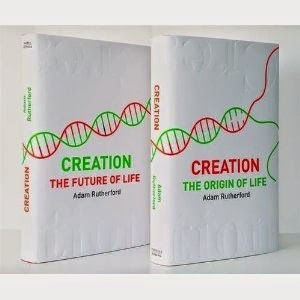 It should, without doubt, be read ‘origin of life’ first then ‘future of life.’ The flip book format is a silly gimmick that detracts from the outstanding quality of this book. Without doubt one of the most important popular science books of 2013 and highly recommended.